Hello fellow crafters! What a fun summer we have had! Now that it is coming to a close, it is time for us to get ready for the school year. That means a lot more routine busyness and a lot less time for crafting. But we can’t end our summer just yet! So we decided that some much needed glue gunning was in order. We also had a three day stretch of rain, rain and more rain, so what better fun than to have a rainy day miniature making party! But I really don’t mind that she is not a crafting genius just yet. I actually adore some of the cute little creations that she makes. She, on the other hand gets frustrated so easily, and she gets super upset when hers doesn’t look remotely like mommy’s. Needless to say, I was looking for something that I could make easily and that she could also help to make. Now I have worked with one inch miniatures before and we have made some very cute pieces out of polymer clay that you can find here. The internet is chock full of polymer clay tutorials as well. But where I love working with clay, it requires a fair bit of patience, and it takes up a lot of time. You have to shape it and cut it. You have to texture it and there are a lot of finicky bits. Then you have to bake it and paint it. Also, there are some things that I just can’t make out of clay even if I tried, and my six year old, well she just doesn’t have that kind of patience. We are instant gratification crafters all the way. Plus I just love glue gunning things. Glue gunning makes me feel like a superhero of sorts. I mean, there is just something empowering about it, you know. It makes you feel like you could build anything. Actually any type of glue that instantly sticks is highly fascinating to me, kind of like a magic trick, and I haven’t found anything that doesn’t stick with the glue gun. So I hit Pinterest. I was basically searching for any tutorials that we could make in less than ten seconds out of things that we already had on hand. I just love reusing, remember. I mean, who doesn’t? I also didn’t want to go to the store because it was raining outside. My ten second maximum for miniature crafting comes from the understanding that I also have to cook supper. I simply can’t multitask anything that takes up more than five minutes of my time because otherwise I’m pretty sure I will burn my house down. I also just can’t justify dedicating more than five minutes of my life to a project that turns out to be smaller than my fingernail. That is my time-space continuum. How much time I put into something is directly linked to how much space it takes up in the universe. It makes sense to me. So with those limitations in hand, we set to work. We gathered up every button (we have a ginormous button stash), bead and jewelry finding that we could find in the craft cupboard, and Pinterested our little hearts out for three days straight. I am seriously thinking of starting a mini club because I would love to see what other people come up with. Plus it would be so much fun! Kitchen, Bakery, Powder Room and Study. Alright let’s get crafting!! Let’s start in the kitchen, shall we? How adorable is this little set? I think it looks so rustic, just like old country Italy. Adorable! The bowls and the tray are buttons, the food is made from wooden seed beads, the champagne flutes are from a package of wedding favours, and the spoons are jewelry findings called bead tips. This little set is made from the caps of hairspray bottles. 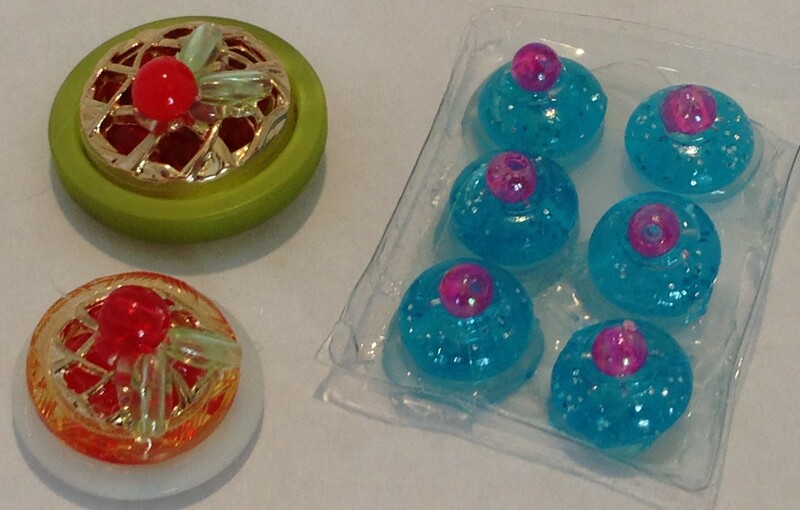 The lids are simply buttons with beads glued on. A perfect instant gratification craft that anyone can do. Just add tiny labels for ultimate cuteness factor. This set is seriously cute because it is so easy. The plate and the pancakes are buttons. 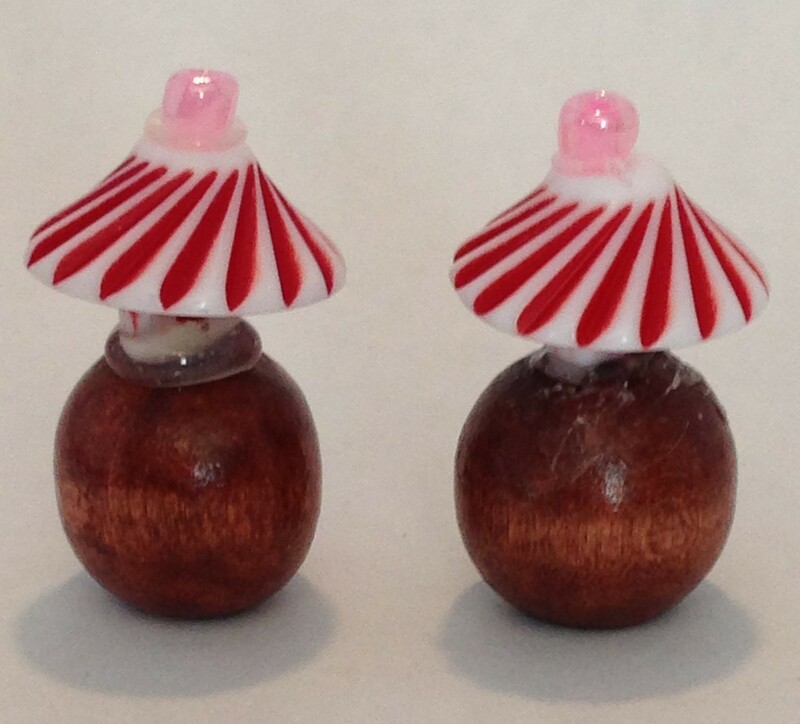 The syrup is made from a bead with a button glued on top and then a tiny bead for the top. The handle of the syrup I just cut off of the back of a button. 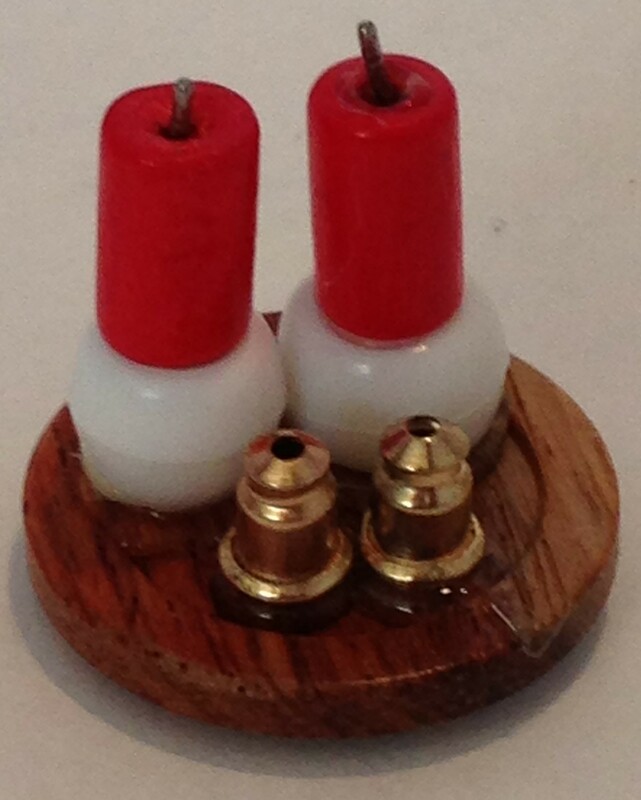 The candlesticks are toothpicks stuck into two beads with a seed bead on top for a flame. I also coloured the tips of the toothpicks orange. Hee hee, these make me smile. Look at those adorable little salt and pepper shakers! And you guessed it, they are made from earring backs! The candles are wooden beads with a bit of wire poked in the top. 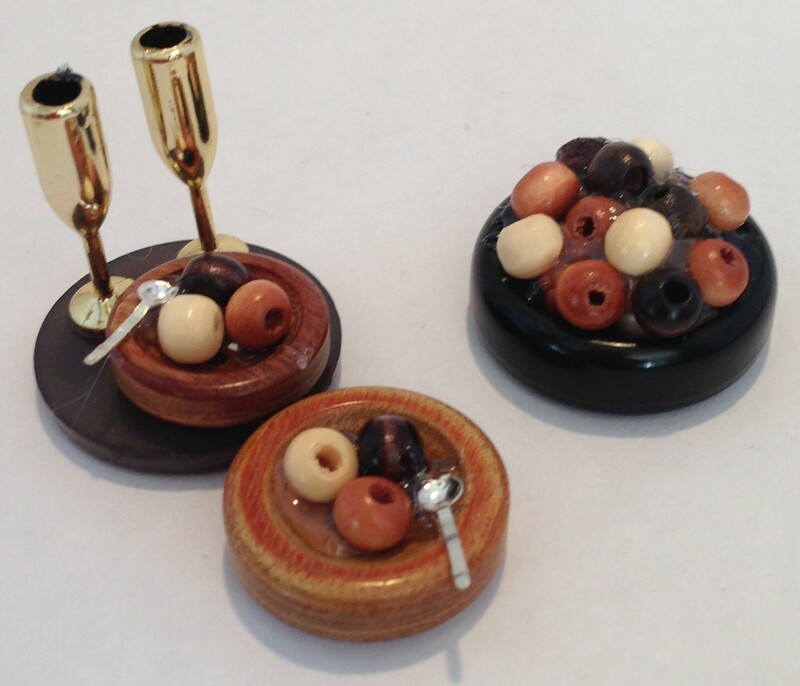 The candle holders are pony beads and the little tray is a wooden button. How cute!! I wish I would have put a little cake on this cake plate. I might make another one that has a removable lid. The dome is actually half of a baby rattle favour (ingenious idea from Pinterest) with a bead glued on top. The base is just a button glued to a bead. This is a tiny set of spice jars made from the plastic stoppers on the little glass bottles that nail confetti comes in. You can get them at the dollar store. 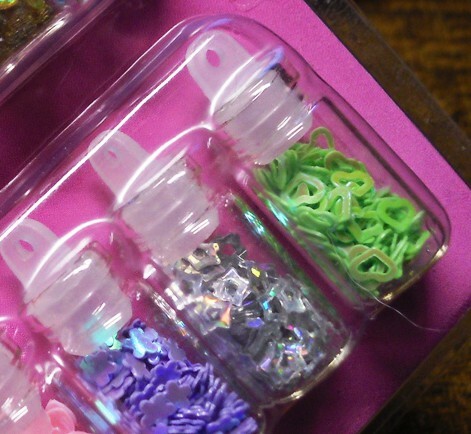 I just cut off the top bit and filled them up with glitter. Then I put a drop of hot glue to close up the bottoms. Raven Tears, Goblin Brains and Dragon Scales. I just couldn’t resist making these. 🙂 Wouldn’t they be an unexpected find in a dollhouse kitchen? They would be just as cute in a witchy diorama. Just take a large wooden bead and glue a smaller wooden seed bead on top. Then just add labels. You don’t have to do potion labels like I did. Any label will do. That concludes our mini kitchen tour. On to the Bakery! 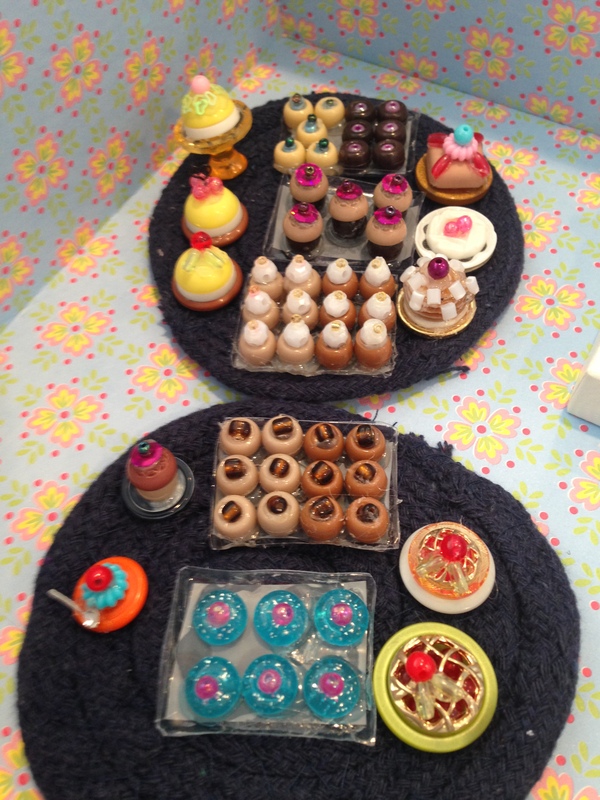 Make some sweet treats for your mini bakery using beads and assorted buttons. That’s all these are made of and don’t they look good! 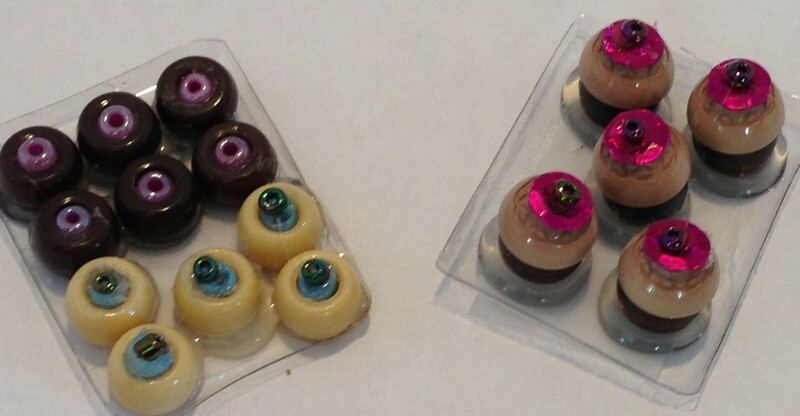 Here are some more delicious looking bakery goodies made with only buttons and beads. Just look at those pies! Can you believe that they are made out of buttons glued together with tiny beads inside? Those donuts are pretty tasty looking too. More beads!! Trays upon trays of cream puffs and cinnamon buns and not one calorie! Pony beads and seed beads are used to make these little sweeties. The trays are made from the plastic packaging of the bead tray. More goodie trays! One holds chocolate and banana donuts. The other is a tray of muffins. 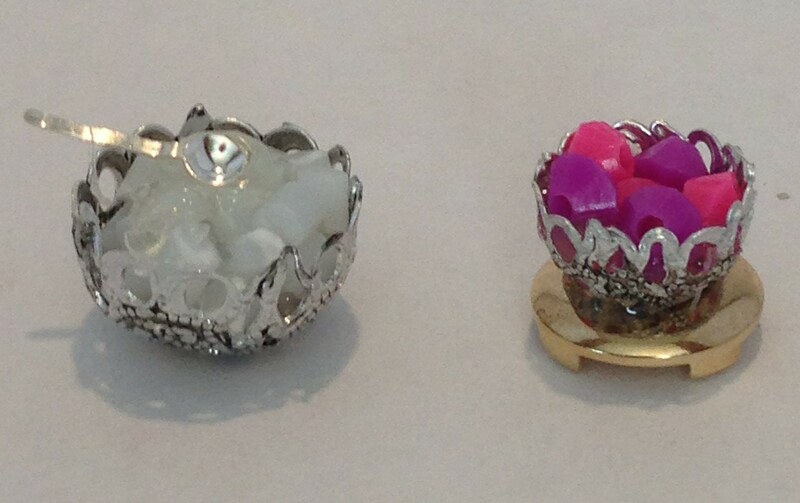 Just insert the back of a rounded button into the centre of a pony bead. Add a sequin and a seed bead to the top. Delish! As you can see there are tons of fun and easy ways to create treats for your mini bakery! Now it’s time to take a trip to the Powder Room! Here is an assortment of lovelies, everything that you could ever need to perfect your mini powder room. Enjoy! Here is a cute piece de la resistance that you won’t be able to resist. I know that I couldn’t. I strung the necklace on a piece of gold wire and used a bead tip jewelry finding as a backing for the pendant which is made of seed beads. 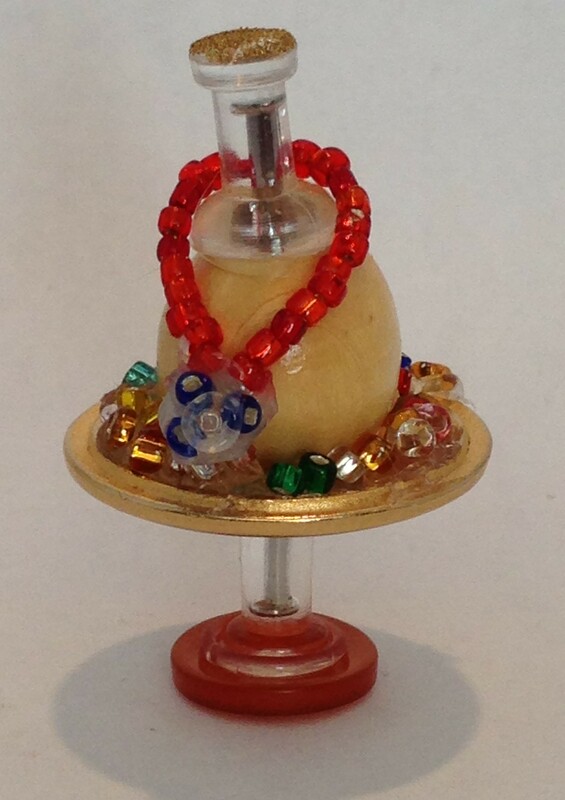 The pedestal tray is made out of two buttons and a thumbtack and the necklace holder is a wooden bead and another thumbtack. I sprinkled some extra seed beads in the bowl of the button as well. This tissue box makes me smile because it is simply a cube bead and kleenex. 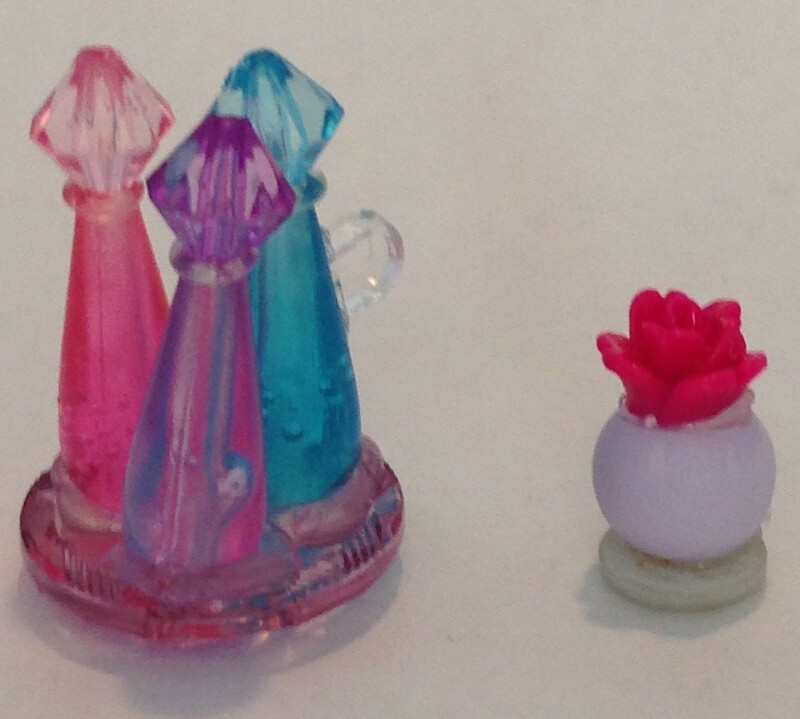 The perfumes and mini flower vase are beads. The bath salt jar is a nail confetti jar filled with vase fill. These are my favourite. I love perfection, don’t you? 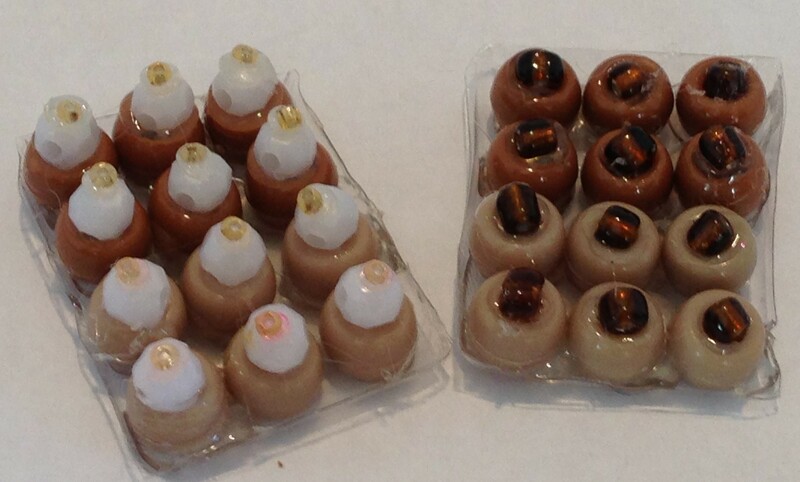 Just fill nail art jars with polymer clay. Add a wire wick and glaze top with clear coat. Add a label and you’re done! An adorable set perfect for pampering. Scissors:straightened hooks from hook&eye kit. Nail polish:beads with toothpicks glued in. Brass bowl:button. 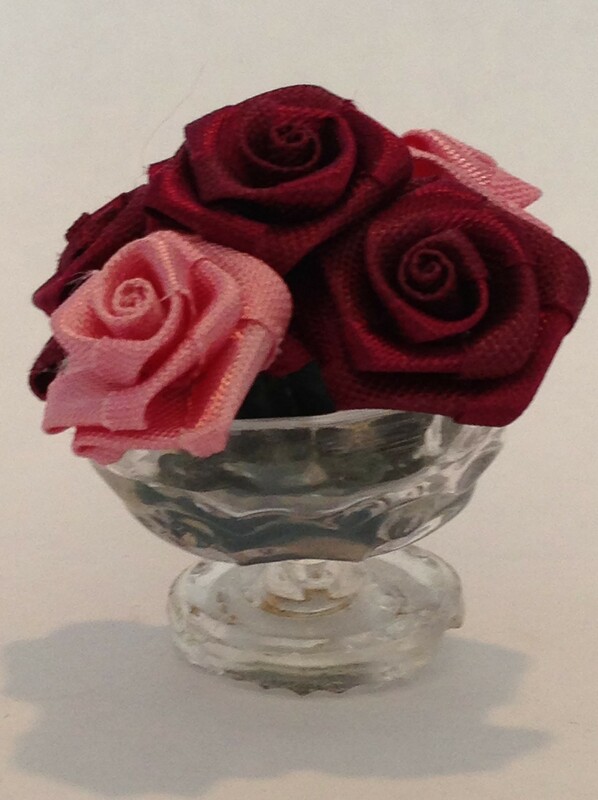 Pink stand:cap from bead jar. 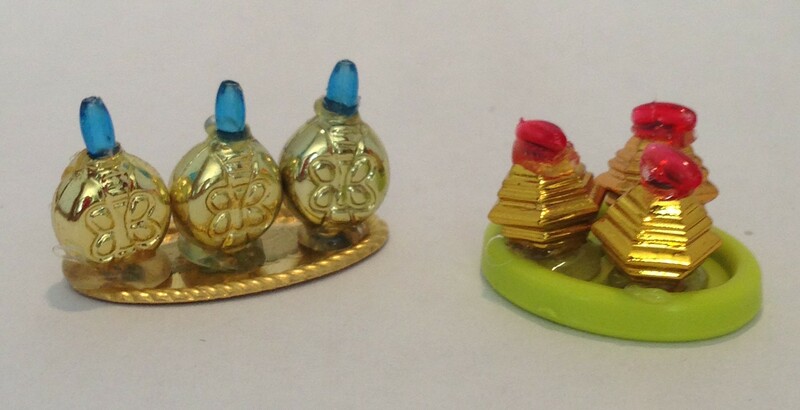 The little bead perfume bottles are the cutest and that little purse is a jewelry finding. I filled the button plate with seed beads. 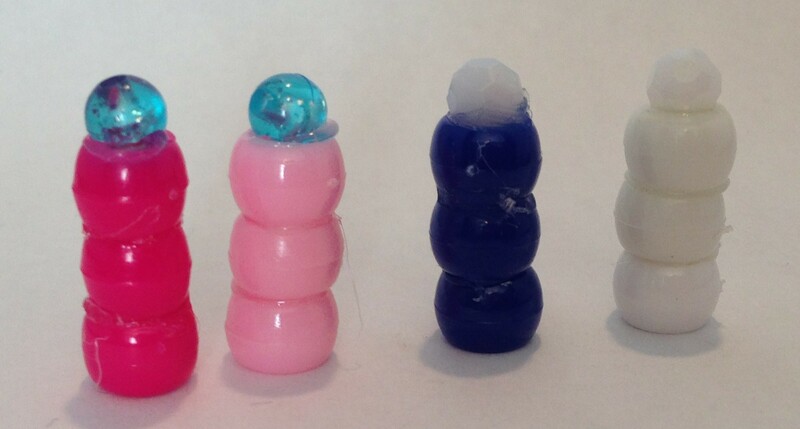 Stacked pony beads make great shampoo and lotion bottles. I love quick and easy crafts. 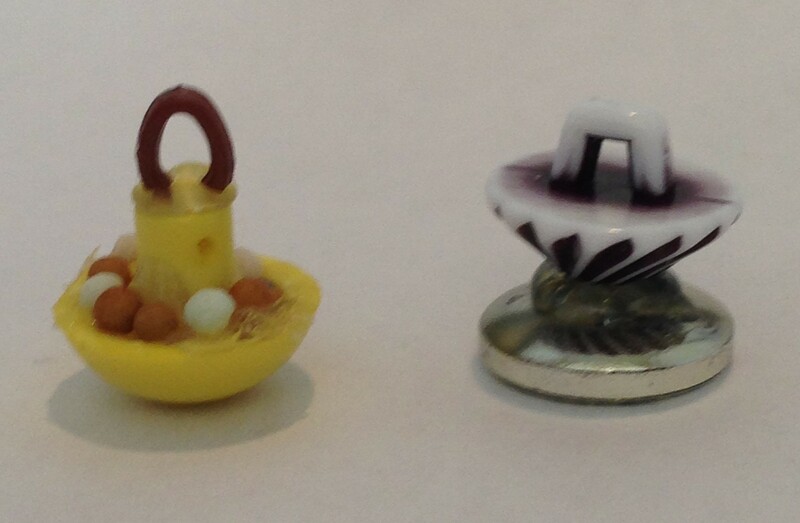 Sweet little bead perfume bottles on a button tray and a teeny flower vase. Brass tray is a scrap book embellishment. Here is a neat little quill and candle set to keep you warm on long winter nights. The quill is a feather and the pot is a strange piece I found in the lid of a soap dispenser. There is treasure everywhere! The candle holder is the wick from a tea light glued to a button. The handle is the back of a button. 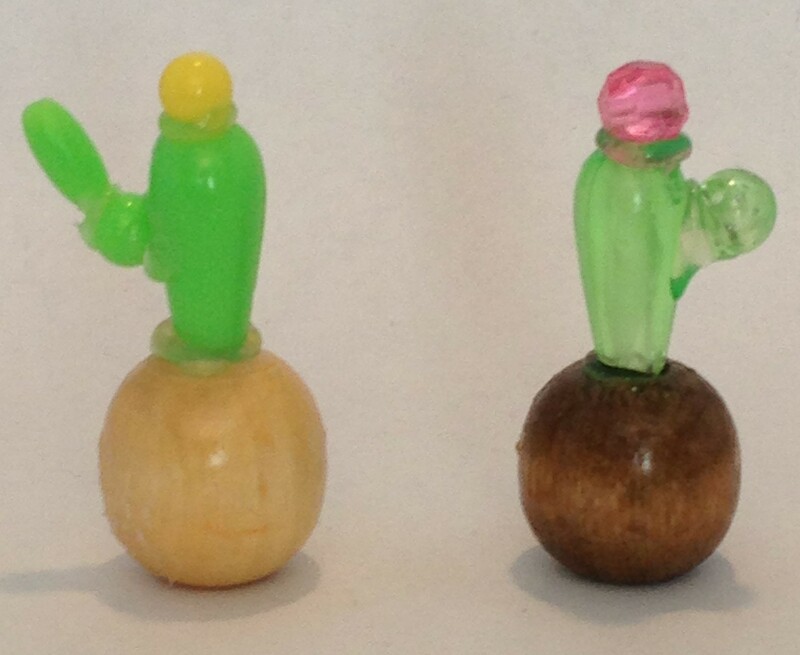 These two stick vases are made with assorted wooden beads and toothpicks. The button bases give them extra stability. 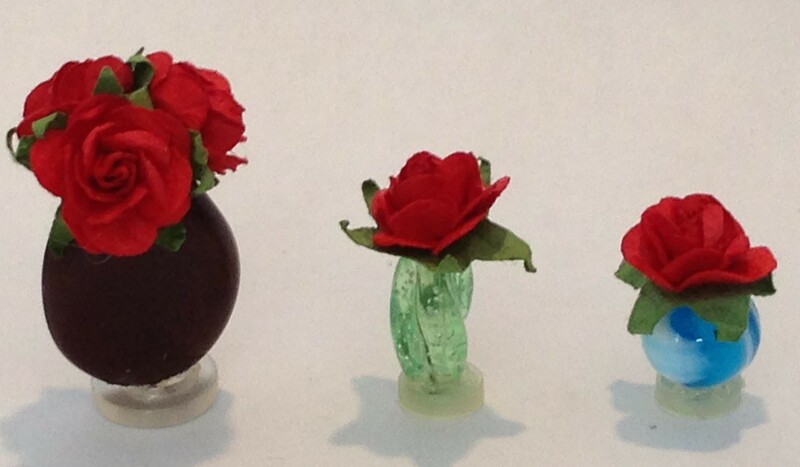 Here are some more assorted vases created by gluing beads and buttons together. I already had the flowers in my craft cupboard. Bead cactus: Aren’t these so cute? My six year old actually made the one on the left. That is how simple these crafts are to do. These lamps are also created using buttons and beads. Thread beads onto a toothpick. Use a larger bead to hold the lampshade and a button for the base. These lamp shades are parts from a baby rattle favour. Here is another use for the baby rattle favour. Add a bead to the bottom and fill with flowers. Pretty! Or forgo the flowers and use as a punch bowl. Here is another type of lamp using buttons and beads. That concludes this post about one inch minis. I will probably find myself itching to make more in the near future. I still have a ginormous stash of buttons that must be wrangled and I will no doubt have a bored little six year old on my hands as the winter months descend on us. I hope that you enjoyed this post. I hope that it got your gears a spinning and your mind a racing to gather up your buttons and beads, and all your tiny little fixings, so that you too can turn trash into lovely little treasures. Here are some littles that my six year old was able to make on her own. 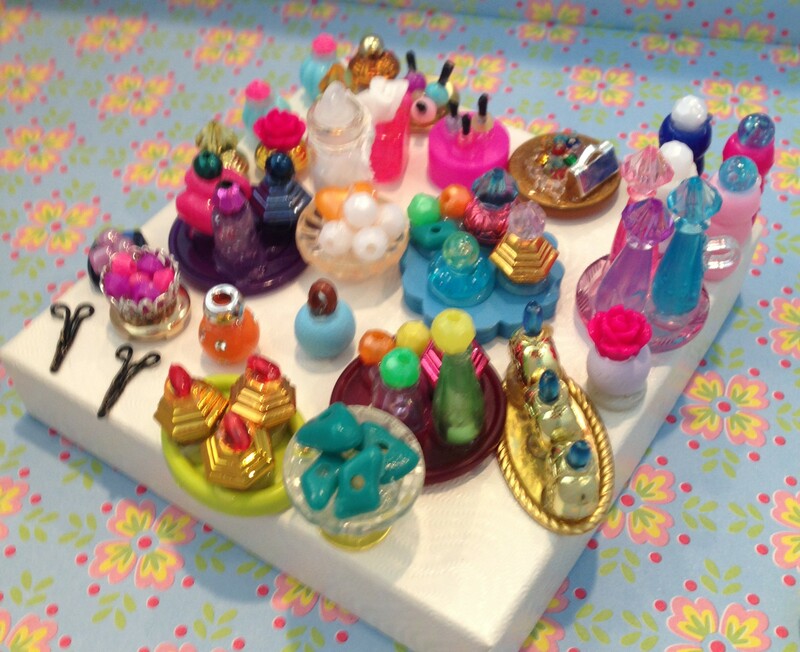 She was just tickled pink at her mini creations.